If you are getting into the Halloween mood and need some free Halloween crochet patterns, look no further. Here are 15 patterns to choose from! 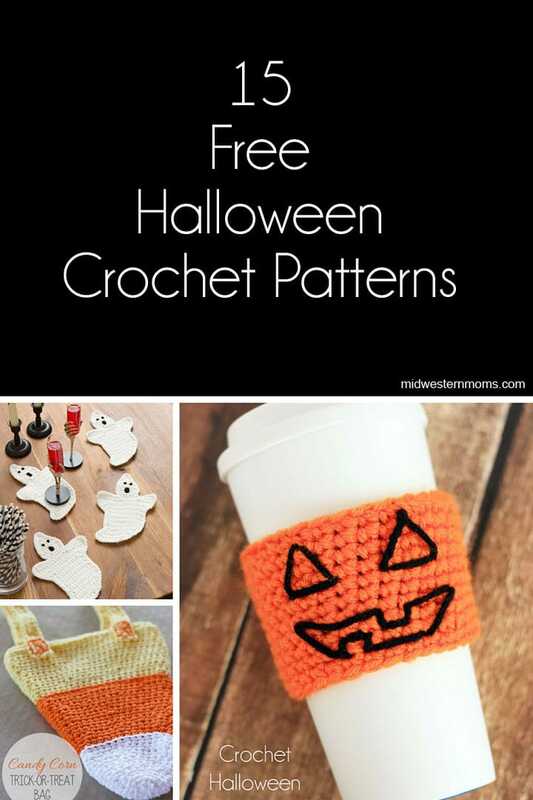 Crochet Halloween Coffee Cup Cozy – Show your Halloween spirit and use a cozy for coffee! Crochet Ghost Coasters – These are super to cute to use for coasters! Lollipop Ghost Crochet Pattern – Forget the tissue paper ghosts. These are to cute! Newborn Witches Hat – Cute little hat for newborns. There is a link for toddlers as well. Pumpkin Applique – This is super cute and it looks easy to make! Lots of photos makes it easy to follow along. Candy Corn Hat Pattern – This is just to cute! Several sizes available. Monster Trick or Treat Bag – This pattern looks like it would hold a bunch of candy. Friendly Ghost Family – These would be cute sitting up on the mantle. Candy Corn Garland – I would love to hang this up. May have to make one of these. Crocheted Candy Corn – These are a cute. Put them in a little bowl to decorate your table. Boo Ghosts – I love this fun little ghosts. Pumpkin Pattern – Can’t have Halloween without a little pumpkin. Spider and Spiderweb – This would look neat up in a window.